Leadnow is at it again. The same people that launched a campaign to send Omar Khadr a love letter in the wake of public outrage over Justin Trudeau’s $10.5 million payment to the terrorist, are now attacking Doug Ford. This group that loves taking money from foreign left-wing billionaires sent a love letter to a convicted terrorist and is in the midst of a brutal and vicious attack on the newly-elected leader of Ontario’s Progressive Conservative Party. Ford has not in fact promised or suggested massive tax cuts and has specifically stated that he will not slash jobs. Anyone that has actually been near Ford’s base would know that it is an incredibly diverse group filled with every ethnic group in the country. Compare that to the Leadnow team that doesn’t profile a single employee that isn’t white. But back to what the foreign-funded Leadnow is claiming about Ford. Ford has never suggested he would roll back abortion access noting that this is a federal issue. Asked about whether parents of young teens should be notified before an abortion, Ford pointed to the fact that kids can’t get any other operation with parents knowing so why should abortion be different. He never claimed he would roll back the minimum wage, and his tax cut plan would put more money into the pockets of low income workers without hurting the businesses that hire them. Leadnow’s campaign is nothing but flat out lies paid for by foreign money. It shouldn’t be a surprise that Leadnow, based out of Vancouver, is attacking a conservative politician in Ontario. Beyond their past work attacking conservatives in previous elections, the co-founder of the group, Adam Shedletzky, is now working for Wynne. It is a rather cozy relationship, don’t you think? Shedletzky spent six years running Leadnow, a few months as a consultant on carbon pricing, and then was hired away to work for Glen Murray at the environment ministry where he brags about having worked on Ontario’s cap and trade program that sends hundreds of millions of dollars to California. Now Shedletzky is a Senior Policy Advisor to the Premier of Ontario, Kathleen Wynne. Leadnow, which gets lots of money from California, is now attacking Wynne’s chief rival for the job of premier, Doug Ford. That is just scratching the surface. Conservative MP Michael Cooper has said he has pinpointed $700,000 from Tides that went to active third party campaigners in the last election, Leadnow among them. As Vivian Krause has pointed out, the group was even started by an incubator for such online groups out of San Francisco that was, you guessed it, set up with Tides Foundation money. There is also the money that Tides sends up to Tides Canada and other left wing groups that then gets transferred to Leadnow. 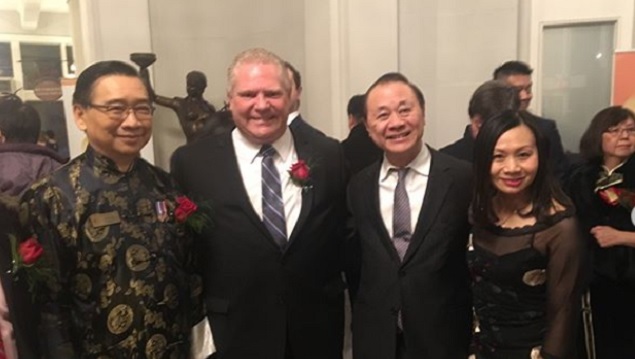 So when I say Doug Ford is being targeted with vicious lies by foreign funded lobbyists, I’m not making it up. In the 2015 federal election the group targeted 29 ridings held by the Conservatives and said they wanted to swing those ridings to the Liberals or NDP, whichever party could beat Harper’s team. Of the 29 seats targeted, 25 of the Conservatives were defeated. Using lies and foreign money. Now Leadnow is bringing their game to Ontario. It is time to expose them for what they are and make sure Ontarians decide Ontario’s election. Did Russia have a direct impact on the American election some would say no and others would say we think so but have no proof however Lead Now is having a direct impact on the Ontario election and there is no outrage. LeadNow needs to be investigated, and jailed if possible. Foreign involvement in our elections NEEDS TO STOP!!! Adam’s very worried about losing his job! So he should be. If he is at all wise he should be applying to work with the Conservatives. I doubt if they will let him in their office, though. The conservatives have a bill S-239 in the Senate making this type of activity illegal. It currently has very little support amongst the Liberals, which should surprise no one. Canadians have to be ever so diligent to protect the most valuable right they have, an INFORMED BALLOT!!! Stopping liberal corruption? An interesting concept that. Corrupt Liberals! Evil bastards from outside Canada should be cast out and not allowed to influence our Canadian elections. Spread the word, folks, that we Canadians will NOT be played by these globalists! We have been sucked in before but not again!